The Advanced Instruments Model 4250 Single-Sample Cryoscope employs the freezing point depression (FPD) method for the determination of added water in milk. 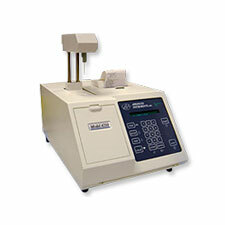 Single sample, 2.0 or 2.5 ml sample size, the Model 4250 Cryoscope design includes m°C or m°H scale, timed plateau or plateau seeking modes, and multi-language display prompts. A frost-free cooling chamber eliminates most routine maintenance. Additionally, the 4250 sample probe and stir-wire are fully accessible for easy cleaning. The Model 4250 allows your plant to manage a premium milk supply, ensure quality products and improve your operating efficiency. The 4250 offersboth the International Reference and screening freezing point methods for rapid, precise, reliable results. Advanced Instruments also supplies CryoLine, NIST-traceable quality supplies for use with our Cryoscopes. Less than 1 unit for every 5°C (9°F) ambient temperature change. Address: Unit 12, Block 3, City North Business Campus, Stamullen, Co. Meath, Ireland. © 2019 Focus Scientific Solutions Ltd.